Forgive me for boring you with the inner workings of a random mind, but it’s been a while since my last blog post and this is what I’m gnawing over at the moment. A friend’s Facebook ‘like’ of some photos of the French region of Auvergne (lovely area, you should go) led me to click on the link from which it originated; a custom steel bike builder in Clermont Ferrand called Cycles Victoire. I was immediately taken by the look of this beaut. Of course, one thing led to another, and suddenly I was seriously considering buying steel for my next bike. 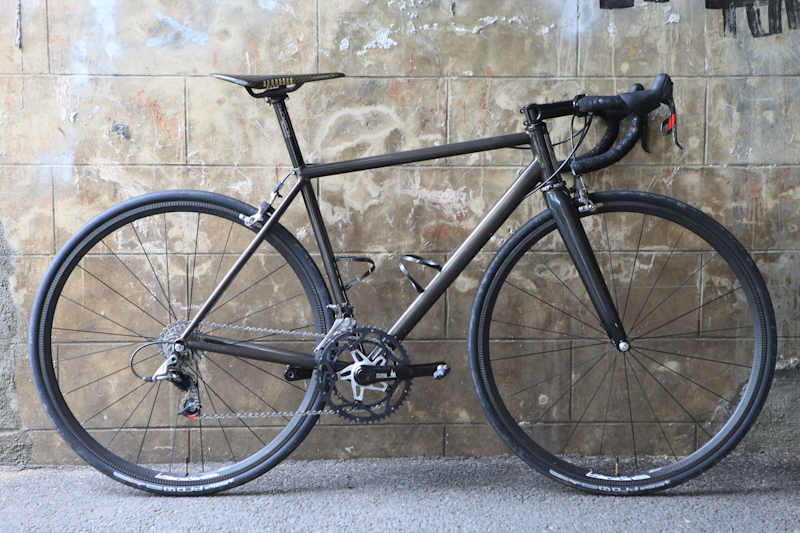 I quickly remembered another French builder that some friends of mine use for their tours on the pavé – Cyfac, which have some great-looking custom-made bikes as well (and a long history in racing, which is nice). Then I got onto some forums to see what people were saying about steel these days (it seems it has changed, and ‘modern’ steel is not the same as what made up your 10-speed) and proceeded to get more confused. I have read many of the pros and cons of steel vs carbon and I know I can’t get a steel bike as light, for one (but I can get it under 7 kg I’ve been assured…and that’s not nothing), and suppose that a steel frame is not going to be as stiff or ‘responsive’ as carbon. Steel aficionados talk of ‘feel’ a lot and both Cycles Victoire and Cyfac will make my frame to order, which everyone says you have to do ‘once in your lifetime’. I could go on, but I’d prefer you to. Does anyone out there actually ride a steel bike for events such as Gran Fondos? Is steel just something you would buy to ‘ride off into the sunset’, as Rob Penn says in ‘The Ride of My Life’? Or, is it an option for someone who wants to ‘compete’ (or at least not be dropped because of my bike!)? I eagerly await the wave of wisdom coming my way. Ti is the other one I’ve been humming and hawing over, Carsten. Can you explain to me the ‘ride’ you get from your Titanium bike? I’ve never ridden one. I think you just stepped into an area that is perhaps inherently biased. I think you will need to find people who have both a very good carbon bike and a steel bike with modern tubing for their views. I suspect that you will end up with, ‘it depends on what you want out of your bike, and what sort of riding you will do with the bike’. As another person said each material does not have inherent ride properties but it is how good the frame builder has been. Design and implentation are key. If not then top end aluminium bikes would not be selling or making a comeback (was it Specialized which started making them again in 2013?). Much is made about frame stiffness. This may be important if you are winding up for a sprint on a high banked velodrome but from a book on the science of cycling it says that a whippy frame is like an undamped spring and most of the energy is released and assists on the opposite pedal stroke anyway. You can have horrible carbon frames and wonderful aluminium. I have a lovely Italian carbon frame and an Orbit hand made frame from the early 90s. It rides beautifully and I think part of this is that the frame has been built very true. I hear of top end Italian bikes which are 4 or 5 mm out with their tracking. That will never feel good even if the frame is light. And of course steel is repairable whereas carbon can just be uneconomic to repair. A Colnago Master steel framed bike will always look so much more beautiful than a matt black Starck-inspired carbon frame. Sometimes you need soul and beauty rather than engineering efficiency. Great comment, Jules. I was thinking about this after checking our Cycles Victoire a bit and seeing how young the company is. I still don’t know what kind of builders these guys are, but I might be more comfortable with someone who is established and comes with some ‘credentials’. Colnago comes to mind, of course, and there seem to be countless excellent custom-frame builders out there to choose from. I keep coming back to this idea over and over, so maybe there’s something to it (getting a bike custom made for me)! But what I want, to be frank, is soul and beauty AND engineering efficiency! Gerry: I do love the ride of my steel Richey Break-Away; different (more absorbing) ride quality. It is not the lightest frame–would not use it for HR. Ti might be it if I go ‘custom’. A friend who did the Cent Cols Challenge this year told me there were guys riding steel bikes on that thing, by the way. I guess they are getting lighter, as you said. Rob Penn’s bike was made by Rourke cycles, Stoke-on Trent, UK. They make custom steel frames to order. There is an article on them in the August Cyclist magazine (UK). According to Jason Rourke, Reynolds 953 steel tubing is the pinnacle of steel tubing which is light and strong and can compete on weight with many carbon frames. The downside is, as always, it is expensive and notoriously difficult to work with. Reynolds 853 is better for racking up the miles. Will be interesting as to what steel the French companies are using! One of my favorite bike documentaries, that one! The French (or the two I’ve checked anyway) are using Columbus tubes, from Italy, although I think at least one of the builders uses Reynolds. Do you ride a steel bike, Bryan? Can you compare to carbon, or is it not ‘that simple’? I do have a Steel Fixie bike that I use a lot for the Brittany winter. The steel bike I think is more forgiving on rides but what is one mans feel for a bike is another mans nightmare!! loL!. I think you will need to loan a steel bike first to see if it is for you otherwise it could be an expensive failure! Matt Assenmacher is the owner of our local shop, he rode a custom built (by him of course) steel with Campy components that weighs around 20 pounds. He loves that bike but he recently put his Madone back together to stay with the group longer and it’s paid off. As for the ride, he swears that it’s far more comfortable but in the end, he was getting dropped because of his bike. It is what it is brother. Steel is sweet (way better than aluminum) but carbon composite is fast. 20 pounds is a bit over the edge for any ride that goes ‘up’, I’d say. It’s your comment about carbon being ‘fast’ that prompted this article, actually. Some Ti and Steel bike builders swear that they can make their bikes as stiff and responsive as carbon. My hope was that someone could attest to this, but so far, no go! Gerry it is impossible to do that. You could be riding a top end carbon bike and Mark Cavendish on a cast iron bike and he would still beat you up the Ventoux!! A bike is only as fast as the legs that power it!!! But what if you put Cavendish on both bikes? Then there’d be something objective to look at, non? These days it is all about “marginal gains” in pro cycling. If steel was faster then carbon then the pro teams (Sky) would be using them, me thinks! Yeah, I don’t know if I’d buy that – steel is always touted as more comfortable, therefore less responsive. Now, aluminum? Definitely more responsive…and I can feel that “responsive” all the way from the tip of my toes to my forehead. I have heard Ti is pretty stiff too though. Good luck man. I have an alu bike, too, and I totally concur! By and large, do pros use things of their own choosing or stuff being promoted by the sponsors? In discussing stiffness, I think it’s important to distinguish between lateral stiffness and vertical compliance. Both are about stiffness, or lack thereof, but they are not the same things. As with stiffness and compliance, things like reponsiveness are not determined solely by the material but also by other factors like geometry and tube dimensions. I also think it’s important to be clear about what is meant by ‘responsiveness’, as I think there is a tendency to conflate the hardness or softness of a ride with how a bike handles (making a turn), namely, that the more you feel every bump in the road surface, the better the bike handles, which is nonsense. There are some people who seem to equate responsiveness with how nervous the front is, and I suppose it is a matter of personal preference if you like twitchy steering. I think it’s beneficial if you are clear about how you view responsiveness and that the other person understands what you mean by it — there is not much point in being prescriptive about the definition when what really matters is that there is a common understanding between you and the other person. I think it’s very difficult to reach a simple conclusion like ‘carbon is X whilst steel is Y and titanium is Z’, particularly when there are several variables at play as above and other factors related to the choice of components, for example, the right sort of wheelset for the given purpose. As usual, a thoughtful response, Chikashi. I knew when I wrote that word that I wasn’t being very clear, but hoped I’d get some good comments regardless (not disappointed). The whole thing is a complete mystery to me and I suppose it will be till I can get out and try some bikes made of different materials. Like you said, though, even that’d be tricky unless the components and wheels were identical (unlikely). I’ve got my eye on a builder in Italy right now who only uses Ti, so I definitely don’t mind skipping across the border to find out (doesn’t hurt that he’s in Tuscany either)!